Nothing says comfort more than food that is from a family recipe. Love, Love the way it feels deep inside as we make and eat old time favorites. This was always "fixed" at Holidays and gatherings whether it is for a celebration or mourning. Everyone makes it a little different. Mine is a little different than my Precious Mama’s and Hers different than her Sweet Mama’s. I’ll share my recipe today with the heartfelt comfort of Memories of Beautiful times gone by. Make this and share with your family if you don’t already. 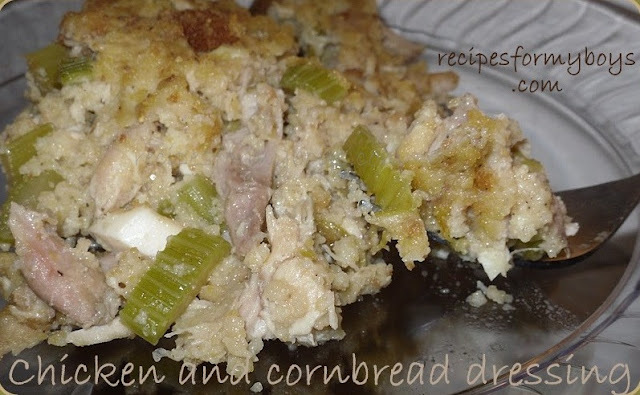 A Big Ole Pan a “Dressin’” just makes everyone smile as they eat way too much of this Southern Favorite. Enjoy <3 and Hugs!